The bench press, crowned the king of all chest exercises by bodybuilders, primarily works your chest muscles, with plenty of emphasis on your shoulders and triceps, too. You may want to try a modified version of this exercise — or avoid it altogether — if you have lower-back, shoulder, or elbow problems. Lie on the bench with your feet flat on the floor or up on the bench if the bench is too tall. Grip the bar so your arms are evenly spaced a few inches wider than shoulder-width apart. Tuck your chin toward your chest and pull your abdominals in tight, but don’t force your back into the pad or overarch it. Lift the bar off the rack and push it directly up over your shoulders, straightening your arms without locking your elbows. Lower the bar until your elbows are slightly below your shoulders. The bar may or may not touch your chest — this depends on how long your arms are and how big your chest is. Press the bar back up. Towel chest press (easier): Roll up a large bath towel and place it across your chest. Lower the bar until it touches the towel and then press back up. This variation is good if you have shoulder problems because it reduces the range of motion and lessens the stress on the shoulder joint. Incline bench press: Incline the bench a few inches and then do the exercise as described earlier. This version emphasizes the upper fibers of your pecs and shoulders. The dumbbell chest press closely mimics the bench press. This exercise works your chest muscles, along with your shoulders and triceps. You may want to modify or avoid this exercise if you have shoulder, elbow, or lower-back problems. Lie on the bench with a dumbbell in each hand and your feet flat on the floor or up on the bench if it’s more comfortable. Push the weights up toward the ceiling, taking care not to lock your elbows or allow your shoulder blades to rise off the bench. Partial dumbbell press (easier): Lower the weights only about three quarters the distance of the basic version of this exercise. Try this version if you have elbow, shoulder, or rotator-cuff problems. Incline chest press: Perform this exercise on an incline bench, and you use less weight than when you perform a flat bench press. You’ll challenge the upper fibers of the pecs more. 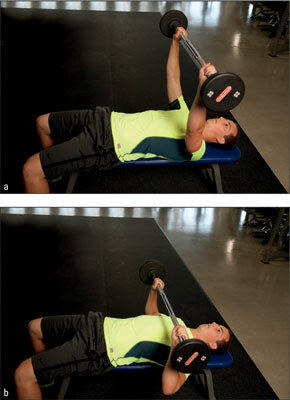 Decline chest press: Do this exercise on a decline bench, with your head lower than your feet. The hardest part of this version is picking up and releasing the weights. Grab the weights while you’re sitting up, hold them against your chest, and ease yourself into the decline position. When you’re done with the exercise, gently ease the dumbbells off to either side to the floor. (Don’t just drop them.) Better yet, ask someone to hand the weights to you at the start of the exercise and take them away when you’re done. The vertical chest-press machine focuses on your chest muscles, with additional emphasis on your triceps and shoulders. Most vertical chest-press machines have more than one grip so that you can work your chest muscles in different ways. Use caution if you have shoulder or elbow problems. Sit in the machine so the center of your chest lines up with the set of horizontal handlebars. Let your feet rest on the foot bar for support. Grip the horizontal handles. Keep your abdominals tight so your upper back remains on the pad. Straighten your arms, pushing the handles forward and press down on the foot bar. When you’ve completed your set, let your feet come back up with the foot bar and let your hands return to the starting position before you let go of the handlebars. Different angles: You may find chest machines that position you horizontally and at many angles between horizontal and vertical. Other machines work the left and right sides independently of each other; in other words, the left and right levers of the machine aren’t connected to one another, so when you raise the weight, both sides of your body have to fend for themselves. Machines with independent action are a good alternative for those with left-right muscle imbalances or those who want to combine the safety of using a machine with the feel of using free weights. Try them all for variety to challenge your chest muscles differently. Vertical grip (harder): Use the vertical handle of your chest machine. This grip factors out a lot of the help you get from your shoulders when using the horizontal grip.